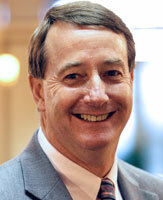 Lennie Barton has served as Meredith’s vice president for institutional advancement since 2010. In this role, Barton provides leadership in the planning, implementation and administration of Meredith’s comprehensive fund raising, annual fund and alumnae and parent relations programs and initiatives. He serves on the College’s executive leadership team and leads Meredith’s institutional advancement staff. Barton has more than 30 years of experience in higher education. Prior to joining Meredith College, Barton served as associate vice chancellor of alumni relations at NC State University. Among his most recent accomplishments, Barton led efforts to grow membership in NC State’s Alumni Association from 4,000 to more than 22,000 and helped the Alumni Association raise $22 million to build the Dorothy and Roy Park Alumni Center. Barton holds undergraduate and master’s degrees and an Ed.D. from North Carolina State University.